Corrosion Technology Services Middle East (CTSME) has continued to build on its impressive track record as leading regional CP company. CTSME has been awarded “ Cathodic Protection System – Demolition and Relocation” contract from an EPC project for Capacity Enhancement of an Offshore facility in Abu Dhabi. The contract was awarded by Chiyoda-CCC Engineering Limited. CTSME has been awarded by Worley Parsons “Cathodic Protection Rehabilitation Detailed Design” contract for a chemical plant in Qatar. CTSME are pleased to have been awarded two different contracts for “Design & Engineering and Supply of Cathodic Protection System” for Debottlenecking of a Coker Unit and “Site Survey and Detailed Design & Engineering of CP System” for 20″ Pipeline and Tank Farm in Kuwait. CTS Europe is pleased to advise that during the 3rd quarter of 2018 we have won several sizeable orders from Saipem, for the Cathodic Protection for Desalinated Water Supply for Spence Growth Options Project, which is in the Antofagasta Province in the Republic of Chile. CTS LLC are pleased to be continuing their on-going relationship with ADNOC Group having been awarded a variation contract for design, supply and installation of cathodic protection system for well casings in ADNOC Onshore fields. In another successive contract award by CPECC CTSLLC will carry out Cathodic Protection for ADNOC Onshore’ s BIF project . CTS Europe are pleased to announce that they have been awarded a second back to back long term cathodic protection contract for maintenance and monitoring with BP Exploration Caspian Sea Ltd across their assets in Azerbaijan and Georgia. CTS Europe are pleased to announce they have been awarded a long term cathodic protection contract for maintenance and monitoring with BP at In Amenas in Algeria. We have held this contract on two previous occasions and are pleased that it has returned to CTSE. CTS Middle East have order from a local trader for Design, Supply and installation Supervision and Testing and Commissioning of Cathodic Protection System for Port of Tanzania. CTS are to continue working with ADNOC to provide CIPS and DCVG surveys for existing pipelines in the UAE. CTSE attended and exhibited at the CEOCORR conference held in Stratford-upon-Avon, England. The three day conference was the first to be held in the UK and was hailed a great success by all. CTS are pleased to be continuing their on-going relationship with SixConstruct having been awarded a contract for design, supply and installation of a retrofit cathodic protection system for Mina Khaled, Sharjah. Also in the UAE, CTS have been awarded a contract for survey of Jet Fuel lines and supply and installation of test posts. Corrosion Technology Services Middle East (CTSME) has continued to build on its impressive track record as leading regional CP company. CTS Middle East has been awarded Design, Material Procurement, Inspection, Testing, Installation and Commissioning of all equipment’s and materials for Cathodic Protection System for KOC’s Train 3 of Wara Pressure Maintenance Project. Contract was awarded by CPECC the EPC for the project. CTS Middle East signs contract with Emirates Global Aluminium for rectification of ICCP system in Power Plant Phase-1. CTS Middle East proudly announce completion of its registration with PDO (Petroleum Development Oman) as service vendor. Click Here to see CTS-PDO registration details. 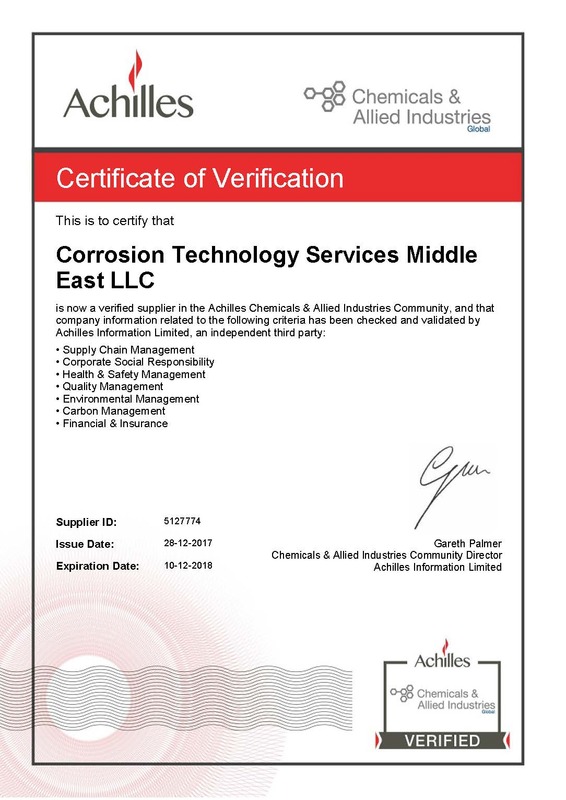 CTS – Middle East proudly announce its accreditation by Achilles in the Achilles “Chemical and Allied Industries Community”. Click here to see the certificate. CTS-Middle East are excited to announce its first project to carry out “ Stress Concentration Tomography” (SCT) surveys of 214 km of pipeline in UAE. The project was signed in collaboration with our principal “M/S. Speir Hunter Limited – UK”. SCT is a non-contact technique which identifies defects in pipelines by analysis of the magnetic signature of the pipeline. SCT can be used on both piggable and non-piggable pipelines. Corporate Social Responsibility 94% – Click here to see the certificate. CTS are pleased to have been awarded a contract for design, supply and installation of sacrificial anode cathodic protection of a sheet piled jetty in RAK. This follows our success in a number of similar projects in the region. CTS has been awarded a Consultancy Study and Tender Package Development contract for restoration of the Cathodic Protection system of a reinforced concrete sea water intake at Ruwais refinery. CTS is pleased to announce it will be working with Rotary Engineering in Dubai for ENOC Refinery expansion project. CTS awarded contract for additional CP scope by Siemens for GASCO’s Taweelah Gas Compression Station. 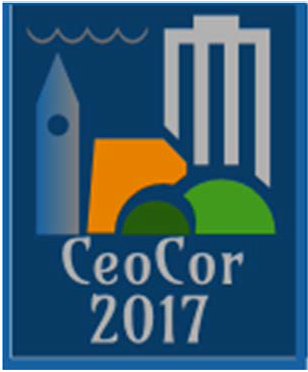 Corrosion Technology Services Europe Ltd are pleased to announce that it will be a “Gold” sponsor of next year’s CECOR event, which will held on the 15th-18th May 2018, in the UK in Stratford on Avon.CEOCOR is a non-profit international scientific organisation which was established in 1981, it’s active throughout Europe in corrosion relating matters of pipelines (external and internal). CEOCOR Members include gas and oil distribution companies, water companies, research centres, pipelines manufactures and specialist cathodic protection companies. CEOCOR provides a forum for technical and scientific exchange, and at the Congress held each spring technical papers are presented and discussed, along with an exhibition hall. CTS attended the NACE Corrosion Conference in New Orleans and presented a case study related to our recent experience in cathodic protection and remote monitoring of sea water intake structures. CTS have in recent months been commissioned to carry out computer modelling studies of induced AC on pipelines and it’s mitigation. CTS are licensees for SES Right of Way Pro software. We are also pleased to have been awarded a contract in the UAE for installation of anodes at road crossings. CTS Middle East awarded contracts for Causeway Pipelines, ADOC -Mubarraz Island and Taweelah Gas Compression Station – GASCO. Contracts were awarded by Siemens LLC – PG Power & Gas and Power, Instrumentation and Control Division of TARGET Engineering Const. co.
November, 2016 Corrosion Technology Services Europe Ltd, is proud to announce signing a 3 year frame work agreement with the premier Gas Supplier in the UK, National Grid PLC, for the provision of cathodic protection services. CTS Middle East was recently awarded along term contract (5Years) for Provision of CP Inspection and Maintenance services to Gazprom Net Badra B.V. at Badra Oil Field, Badra, Iraq. CTS will audit and maintain cathodic protection systems on both plant and piping. Corrosion Technology Services Europe Ltd (CTSE), have signed a long term “Frame Work” agreement with National Grid in connection to underground pipework in the United Kingdom. The scope of work encompasses regulatory CP Field Surveys, CP Audit Surveys, CP Fault Finding works and CP Adhoc Services. Corrosion Technology Services Europe Ltd (CTSE), has signed a long term “Sole Agency Agreement” with Speir Hunter Ltd, for the provision of their market leading non-invasive Survey technique. Based on the science of stress-magnetisation of steel, the unique and patented SCT inspection method is a versatile and potentially game-changing tool that can provide clients with a comprehensive insight into the condition of their pipelines. It can detect all sources of localised stress including (but not limited to) internal and external corrosion, coating defects, and metallurgical defects due to sagging or twisting. It is remote and non-invasive, targets non-piggable pipelines and is not limited by pipeline configurations such as tight turns or valves. It does not require pre-inspection preparation activities that entail hidden costs or the disruption of normal pipeline operations. It is currently being used as a screening tool and a complementary inspection technique with potential to become a standalone inspection method. Corrosion Technology Services Middle East (CTSME) has continued to build on its impressive track record as leading regional CP company. CTS Middle East has been awarded contracts by TSH-JV (Tecnicas, Sinopec, Hyundai) for Cathodic Protection System for KNPC Al-Zour Refinery Project Package#1. In another successive contract award by Petrofac CTSME will carry out Cathodic Protection for Gas Train 5 Project at Mina Al-Ahmadi (MAA) Refinery Kuwait. CTS and our partner Leopad will be exhibiting at the NACE Corrosion Show in Kuala Lumpur in August. CTS Europe have been awarded contract from Saipem for material supply to SCPX Pipeline Project in Azerbijan. Paper presented by CTS Technical Director at NACE 2016 in Vancouver, Canada has been published in the May 2016 edition of NACE International magazine Materials Performance. Check it out. CTS Technical Director Rod Callon presents a paper at the ‘’Concrete Service Life Extension Conference’’ in Orlando, Florida. CTS has been acknowledged by Ras Gas, Qatar for having achieved 500,000 man-hours without LTI. CTS have been on site over six years performing monotoring and installation works as well as manpower supply. See CTS at the 16th NACE Middle East Corrosion Conference in Bahrain from 8-11 February. CTS will be exhibiting along with our Principals, Nuova Giungas and RCS as well as presenting two technical papers. CTS Europe will once again be exhibiting at the Concrete Show to be held at the NEC in Birmingham, England on 17/18 February. CTS will be promoting our specialist power supplies and expertise in the protection of steel in concrete from corrosion. CTS long service awards recognize the achievements of staff with over 5 years commitment to the company. This year we were privileged to have one employee complete 30 years of service, two 25 years and one 15 years. Saudi Aramco award CTS a contract for audit and survey of cathodic protection systems and coatings for the 1200km East-West pipeline. CTS Managing Director Steve Wroe made a technical presentation NACE at the UK Chapter AGM held in London and also received an award in recognition of 25 years service to the association. CTS Europe and CTS Middle East have been awarded three contracts on the RAPID Project in Malaysia. CTS Middle East has been awarded a Consultancy contract by TAKREER (Abu Dhabi Oil Refining Company) to study the condition of reinforced concrete structures and existing CP System at Ruwais refinery. CTS in collaboration with Nuovagiungas s.r.l. Italy participated as sponsor in the Corrosion Conference held in the UAE by the US-based National Association of Corrosion Engineers, NACE. It was held from 12th-14st May at the St. Regis Hotel, Abu Dhabi. CTS is pleased to announce it will be working with SIXCO in Fujairah- UAE for Sacrificial Anode CP for new jetty at Fujairah port. CTS is pleased to announce it will be working with the Tecnicas-Reunidas –SIXCO JV for CP of Sea water intake structure at Sohar port Sultanate of Oman. CTS Middle East was recently awarded a contract by RAS GAS to upgrade CP systems for buried piping. Recently CTS has been awarded $ 10 million EPC contract by Abu Dhabi Company for Onshore Oil Operations(ADCO) to provide Cathodic Protection to Well Casings in ADCO Fields. CTS has been awarded AED 10 million contract by Abu Dhabi Gas Industries (Gasco) for replacement / repair of Cathodic Protection System and Anodes at Ruwais Natural Gas Liquids (NGL) Fractionation plant located in Ruwais Industrial Area, Abu Dhabi. Corrosion Technology Services Europe Ltd has continued to build on its impressive offshore track record. CTS Europe has been awarded another successive contract for Cathodic Protection Monitoring Systems with an oil super major in the East Asia Pacific region. Scope of work included, design of monitoring CP system for offshore platforms and supply of materials. CTS exhibited at the Maysan Oil Show, Iraq from 23rd February with our local partner Iraqi Resources Company. CTS attended the 15th Middle East Corrosion Conference & Exhibition 2014, hosted in Bahrain from 3rd to 5th February. CTS Europe has been awarded a $1.5 million contract by STFA Turkey to provide cathodic protection for a 1256 pile jetty being constructed at Tupras Izmit refinery. The jetty will be protected with impressed current cathodic protection and supply will include Zone 2 rated hazardous area transformer-rectifier units with capacities up to 450A. In addition, a quay wall containing 562 piles will be protected using sacrificial anodes. CTS Engineers recently completed for BP Georgia the Alternating Currents (AC) Mitigation, which aims to protect 186km of identified lengths of the BTC/SCP pipelines from the potential risks caused by interference of alternating currents across 18 sites. CTS is pleased to announce it will be working with Petrofac on the ADCO Bab Compression Project. This project worth in excess of $600,000 for CTS represents the latest in a long line of successes this year for the Group. The cathodic protection scope of works includes Tanks, Trunk-lines and Flow-lines, the total project is expected to last 24 months. CTS Middle East was recently awarded another project at Ras Laffan, with Qatar Gas Transport Company Ltd (Nakilat). The scope of work included Cathodic Protection for reinforced concrete pier, associated structures and submerged steel piles. This year is proving to be a fantastic for the Middle East Concrete Division, with prestigious contracts awards spanning the Kingdom of Saudi Arabia, United Arab Emirates and now Qatar in 2013. CTS Saudi Arabia office awarded $3.4M contract by Petrofac for cathodic protection of tanks and other structures on the new Saudi Aramco Jizan Refinery. CTS will utilise their resources in Saudi Arabia for design, manufacture and installation support. CTS are approved by Saudi Aramco for the manufacture of cathodic protection equipment. CTS Bahrain and Saudi offices awarded contracts for replacement of CP systems. CTS have ben awarded contracts totalling $3.6m for the replacement of power supplies for projects in Yanbu and Jubail Saudi Arabia. A contract for replacement of a failed CP system in Bahrain supplied by a competitor complete a trio of awards this month. June 14th Raju Narayan of CTS Europe presents a paper on monitoring of Cathodic Protection on offshore structures at the ICorr seminar held in London. CTS are proud to support ICorr in this event. Check out Raju’s presentation on our website. CTS awarded contract to protect world’s tallest building. CTS Saudi Arabia office have been awarded a $4M contract for design, supply and installation of cathodic protection for the piles supporting the Kingdom Tower in Jeddah which is destined to become the world’s tallest building. CTS Europe mobilise on schedule for BP BTS contract. CTS Europe managed to mobilise on May 6th to start maintenance works for BP manages assets in Azerbaijan and Georgia. Mobilisation also corresponded with the opening of CTS offices in the two countries. CTS awarded contracts worth 1.5million Euro for supply of materials for Sonelgaz, Algeria. CTS Middle East office have been awarded two contracts totalling almost 1.5 million Euro’s for supply of insulating joints and hazardous area junction boxes by CAMEG. CTS Europe will supply the junction boxes and our partner Nuova Giungas the isolating joints. CTS are expecting further contracts from Sonelgaz. CTS Europe awarded five year contract from BP Caspian for maintenance of BTS pipeline and associated assets. CTS Europe are pleased to have been selected by BP for monitoring work on the BTC pipelines in Azerbaijan and Georgia and of assets at Sanchagal Terminal. The contract involves the hire and training of local engineers and technicians as well as mobilisation of expatriate engineers. CTS awarded $2 million material supply contract with Saipem for Shah Gas Development Project in Abu Dhabi. This follows earlier awards from Saipem, Samsung and Tecnicas Reunidas for the same project. CTS will be designing cathodic protection systems for tank bases, tank internals, piping, hydrants, well casings and pipelines. 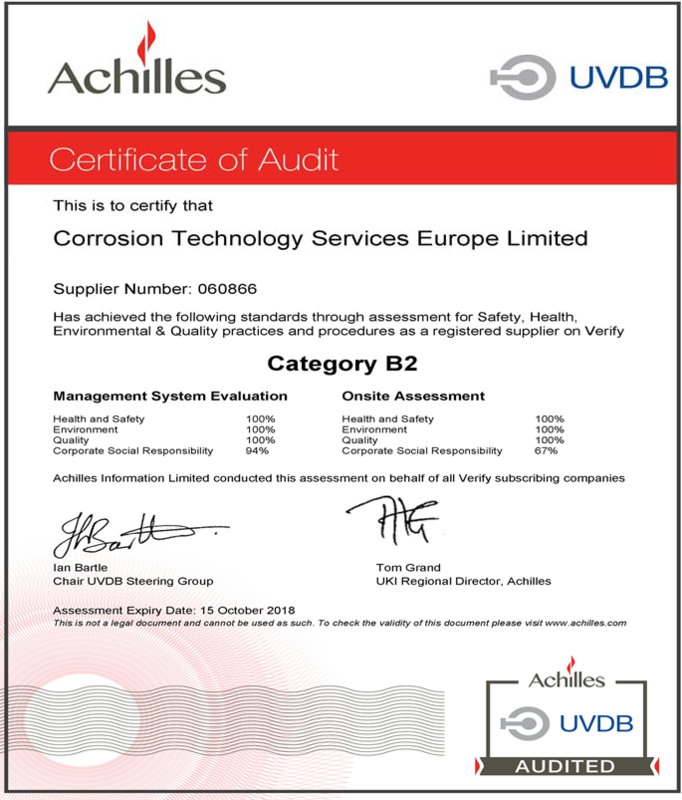 Also supplied will be monitoring probes for detection of corrosion of steel in concrete and a comprehensive remote monitoring and control system for Samsung and Technicas projects. CTS India awarded ISO 9001 certification. CTS’ Saudi Arabian company successfully passes inspection for 16 nos. transformer-rectifier units for use in hazardous areas. CTS are certified by SIRA of the UK to produce transformer-rectifier units for use in Zone 2 Gas Group IIA/B areas. The supply follows supply of 12 units for the Pearl GTL project in Qatar. The current units are heading for Shell Majnoon project in Iraq. CTS India receive approval as vendor for Cathodic Protection for Pipelines. PML have been awarded their first project for protection of steel in concrete. The project involves replacement of power supplies on an existing cathodic protection system on a car park in southern England. Also included was an integrity assessment of a swimming pool structure. PML is a member of CPA, the leading association of companies working in the field of protection of concrete structures and is also a sustaining member of the UK Institute of Corrosion. CTS India receive approval as vendor for Cathodic Protection for Plant. CTS seal agreement with Aegis Technical Systems of Dubai to licence the Aegis ARMS remote monitoring system. CTS have been successfully using ARMS for a number of years and have found it to be the most reliable system available. Previous projects mainly centred around protection of steel in concrete. CTS are now incorporating the system into power supplies manufactured by PML in the UK and our Saudi office for pipeline and plant projects.